Let’s face it: diving in the high desert of Southeast Oregon gets a bad rap. It’s a long way from the closest SCUBA shop and compressor to this part of Oregon. Viz in the summer can be nil. There are only a few rocks and trout to look at underwater. The list of complaints goes on and on. In spite of some of these shortcomings, Indian Creek Campground has some pretty awesome diving because of the island (usually a peninsula when the lake isn’t full) with its steep cliffs. This is probably the most fun dive site of the car-accessible shore diving sites along Lake Owyhee. If you get bored of doing these sites, there are 52 miles of dive sites along the lake that are accessible by boat. And as luck would have it, Indian Creek Campground has a boat ramp. Indian Creek Campground has some great topography underwater from the steep submerged cliffs of the island (usually a peninsula during low water years) directly north of the store and boat ramp. Imagery ©2018 Google, Map data ©2018 Google. Lake Owyhee Reservoir: At 52 miles long, this reservoir has a huge number of dive sites for those with access to a good boat. The reservoir sits down in a canyon which makes for interesting wall dives. 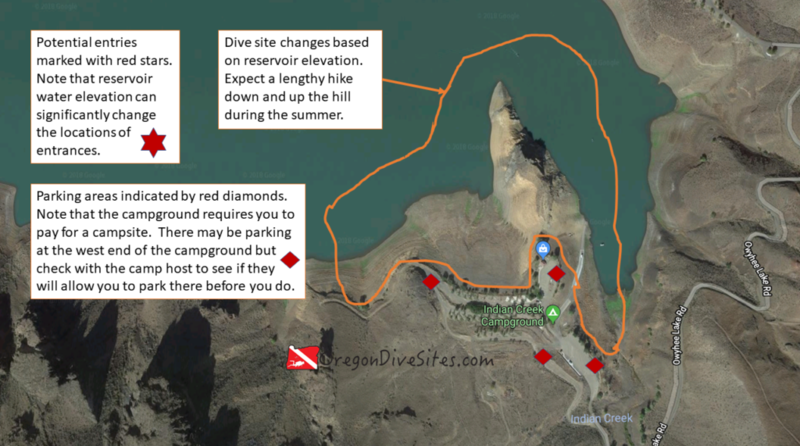 Owyhee Lake Road Pull-Outs: You can dive at the two pull-outs before the first boat ramp. Gordon Creek Park and Gordon Boat Ramp: There is some interesting topography to the west of the boat ramp. McCormack Campground: This is a great place to base out of to dive the area. You can walk from your campsite directly to the water. Check with the campground hosts or the store and boat ramp operator before you park. During busy summer months, parking can be hard to come by. The main attraction here is the island (peninsula during low water times) just north of the store. The island runs north-south. The east side has the more dramatic topography to dive but the whole thing is worth a look. Watch for slick mud near the waterline when the water level has been falling. Check with the boat ramp attendant or in the store before using the boat ramp as an entrance. Watch for boat traffic — boaters aren’t used to seeing divers here. This is a shore dive but can also be dived with a boat. A boat could be useful to get to the very northern tip of the island. There may be a few waves from boat wakes. Also currents can crop up when the dam is spilling a lot of water. At the height of summer, viz can be nil due to algae blooms. In the late winter and spring, viz can get up to 30 feet when cold, clean water flows into the reservoir. In the winter, temperatures can dip into the 30s. In late summer during low water years, temps can be in the 60s. Try diving here in the spring when the reservoir is the fullest and you have the best chance of good viz at Indian Creek Campground. You might find 100 feet in the middle of the channel if the lake is full. This is an altitude dive site so be sure to have appropriate training. The dive is rated intermediate because of the altitude requirements. Also it can be easy to go far enough from your entrance that you might need a lengthy surface swim back. If you can park by the store and the reservoir is full, you will only have to go a few feet. Otherwise, expect a few hundred feet to a thousand foot walk. No surface swim is necessary although you might want to swim a few hundred feet north along the island. The campground here is a good place to base out of for a few days of exploring Lake Owyhee. There are a few other campgrounds in the neighborhood as well.